Update: Added Judge Koh's order denying Apple's damages enhancements. In the document filed with the U.S. District Court for the Northern District of California, Judge Koh found that Samsung did not act willfully in infringing on Apple's patents, denying the Cupertino company a chance to triple damages associated with the suit. DENIES Apples motion for judgment as a matter of law that Samsung is liable to Apple for breach of contract and antitrust violations stemming from breach of the ETSI IPR Policy. One of the more important findings in Tuesday's batch of rulings is an order on Apple's motion for judgment that Samsung was willful in infringing on the patents in suit, an issue that the Apple v. Samsung jury found to be the case in five cases. Judge Koh notes that in order to find willful infringement, a two-pronged analysis of subjective and objective inquiry must be satisfied. The judge found similarly for Apple's remaining JMOL contentions, including the D'889 design patent with which Apple previously won a short-lived injunction against the Galaxy Tab in 2012. Agreeing with the jury's findings, the ruling stated, "Here, the jury found that there was no subjective willfulness, and the Court agrees that this finding was supported by substantial evidence in the record. Therefore, even if the Court were to find the objective prong satisfied, there can be no ultimate willfulness determination. Accordingly, the Court need not reach the objective analysis." As for Samsung's '941 patent, the filing describes the property as "a system for data transmission over wireless systems by chopping up data in discrete packets, with headers containing information needed for data reassembly after transmission." Specifically, Apple argued that claims 10 and 15 were invalid due to a single piece of prior art called the "Agarwal Patent," which deals with similar technology when used in conjunction with satellite rather than cellular networks. Samsung previously attempted to demonstrate invention by noting several elements of claims 10 and 15 are absent from the Agarwal Patent, including three specific technical terms. In response, Apple noted that the prior art does, in fact, address both satellite and wireless networks, effectively nullifying Samsung's first argument. As for the three specific terms, Apple presented expert testimony from Dr. Edward Knightly that accounted for the missing elements. 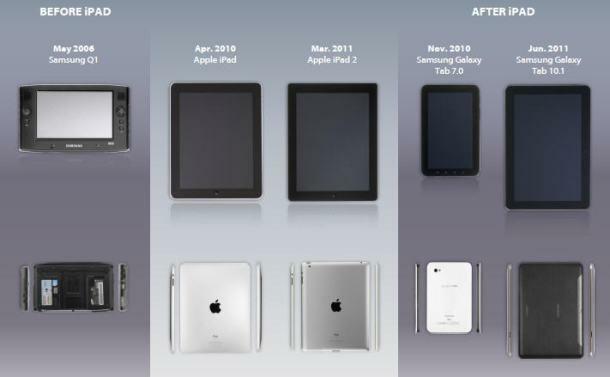 On whether Apple's unregistered iPad and iPad 2 trade dress are protectable, Judge Koh sided with the jury and found no infringement or dilution from Samsung.